Sochi, Russia - – Aides to the Chief Rabbi of Russia, Berel Lazar, are defending his actions after many questioned his attendance of the opening ceremony of the Olympics during the Sabbath. 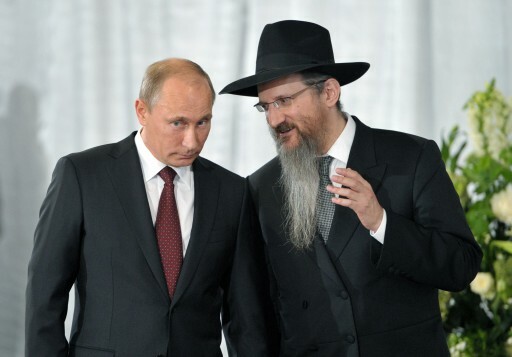 Maariv (http://bit.ly/1eyQ3No) reports Rabbi Lazar, a Chabad emissary to Russia, attended the opening ceremonies after being invited by President Putin. An assistant to Rabbi Lazar confirmed his attendance and stated the Sabbath was not violated and the rabbi did not bring anything with him. Chabad officials and Jewish groups in Europe were asked not to respond to the subject, but have noted their displeasure with the rabbi’s attendance. Russia’s Jewish community included various events during the Olympics, such as a Sefer Torah dedication of one of the three synagogues specifically built for the occasion. Give the rabbi a break. And the Rebbe didn't even want a Chabad house at prior Olympics because of the avodah zarah origins. Just stick your fingers in your ears, close your eyes tight, and keep saying "heter mishum eivah" over and over again. Chabad and there shluchim are great, but I'm not sure if this is what the Rebbe meant. I have spent a little time around the rabbi when he was in America recently. He seems to be a very warm and caring yid. I am sure everything he did was al pi halacha. One story I have heard was that he attended a military show on a Friday. Beforehand he was assured a plane would be available to take in back in plenty of time. Unfortunately there were delays in the plane taking off early. It did leave and land at the airport in Moscow before Shabbos. There was no time to catch a ride home/to shul. So he walked for hours from the airport to his Shul. Shabbos morning he was at shul bright and early to serve his congregation. as we saw from yesterdays daf yomi sukka 10b about not hanging clothes on top of a sukka to dry lest someone from the public not knowledgeable think clothing which is a klei and mekabel tuma may be used as kosher schach , so too although their may be heterim such as meshum 'eiva' for a rav to attend public events etc. but for a chief charedi rabbi to be seen in such a public venue as the olympics isnt proper and can have a long term ripple affect on his efforts at kiruv and shabbos etc. I would presume that the russian pres is aware that a religious jew cant do certain things on shabbos. that being the case he shouldnt have gone to the openings but rather arrive on motzie shabbos. if netanyahu can walk back to his hotel in norway on friday night because of shabbos dont we expect at least as much from a frum rav not to be seen at an event not at all in the spirit of shabbos ??? Just a thought. Maybe the Rabbi felt that if he didn't attend Putin would feel slighted and this might effect the Jewish communities relationship with the government? Maybe even effect the security of the Jews? If one looks at it that way, one can understand the Rabbi going. For the wonderful work Cabad does around the world on an ongoing basis, they're entitled to make a mistake! No one is perfect! BTW, Chabad like Cocoa Cola can be found internationally, what a concept! He is Putin's lackey...remember when he gave Putin the HUMANITARIAN AWARD (sic!) in the name of world Jewry at the commemoration of 60 years of the liberation of Aushwitz? When he massered the chief rabbi of Moscow, Rabbi Goldshmiedt? Anyhow, Goy She-shavas is chayav misah! Better he should attend the games on Shabbos Kodesh. Haven't we learned anything from Ester living with Achashverosh. Yes she also had a "HETER" to do it. What she did with Achashveirosh is not exactly what we would expect any Jewish Girl to do. She was under pressure of Malchus and through this she was able to save the entire Jewish Nation - which is why she relied on this "HETER". Otherwise she wouldn't obviously. Likewise Lazar was under pressure of the head of the Malchus of Russia, and appeasing him, helps save the spiritual lives of countless Yidden throughout Russia. Considering that he did not violate any Halacha at all, not even Midrabonon (Unlike Ester), it was not only permitted but required, in order to help him save the lives of Yidden in Russia Spiritually. There is a famous story told about one of the Chabad Rebbe's who had Mesiras Nefesh to spend an entire Shabbos inside a BAR in Russia, with Shikurim, there, who are known for the hatred of Yidden and he even had to befriend all the Shikurim and behave like them, to survive the Shabbos. The Rebbe had put himself in that situation, an entire Shabbos (not just part of Friday Night), in order to save other Yidden in Russia. The gemara in Kesubos says eiskei rabim (the needs of the public) can be done on Shabbos even it entails discussing issues of melacha etc. This includes traveling and discussing matters with the authorities on Shabbos. I assume no one here is a posek, but it doesn't take a gaon to be don l'chaf tzchus that there was a valid heter for the Chief Rabbi. Wasn't there a similar situation with the British Chief Rabbi for attending an event on Shabbos? It seems that the koved of a king (putin is more powerfull then many kings) requires unique circumstances and Rabbi Lazar's attendance should be seen as such. Tzar, give me a break.R. Lazar is a friend of Putin. There was no pressure to comply he did it on his own-questionable behavior. “ Today is Purim Katan. Who told you there any pressure. He went to a sporting event. Lkaf zechus maybe he had a good reason but its not clear there was any heter. The previuos posters comparison to esther is obviously different. Epes, the letter of the law might have been followed but not the spirit of the law. What might happen is that Yidden on the fringe of observance see this Lubavitcher rabbi attending a Friday night game and say to themselves, that there is a baseball, basketball, football, soccer, you name the ball game, I will pay in advance and walk to the game, and shoein, it's kosher because I saw this rabbi do it. This is the real issue. Likewise to the comment about "iskey rabim" who wrote "even if it entails issues of melacha"; is incorrect, it does not allow that a *melacha* done. And iskey rabim would be like in the story of the Rebbe who went to quell a bad decree against Jews; not to honor putin at the Olympics! It's sill worthwhile to be melamed zchus; for maybe I and other critics wouldn't succumb to Putin's pressure; but please do not turn this into a mitzvah of "isskey rabim" and become martyrs at the expense of flagrant zilzul shabbos! Everything is mutar for the melech putin, kol shekein for the heilige rebbe's shlichus. Who are the fat yidden to complain. He has to get Putin to make Chabad the melech over all russian yidden. Az men must, men must. can we be dan lchaf zechus and think that maybe rabbi lazar wanted to help other yidden in russia by doing the bidding of the "king?" If you're not living in Russia I dint think you should judge this rabbi. America is not Russia, the Jewish community is in a precarious state, I am sure he thought it over a thousand times. For those holier than thou commentators on this site, they seem to have short memories. I remember when Jews in the Soviet Union, were not allowed to bake Matzah for Pesach. In fact, Matzah had to be shipped to Russia. Brit Milah was prohibited, as well as the teaching of Hebrew or Yiddish. Jews who dared venture to the few existing Shuls were closely watched by the government. Even when Jews gathered in Moscow on Simchas Torah to dance, they were beaten by the authorities. For decades, Jews could not leave the Soviet Union. Now that those days are past, we should be grateful that the Chief Rabbi has very good relations with the President of Russia. Isn't it better that there are good relations with the government, than for the government to turn against the Jews, as was the case in the late 19th century, and early 20th century, when pogroms were the norm? Hence, I support Rabbi Lazar's decision. Once you become somebody's poppet - you have to do what your master tells you to do. Please stop talking about Chabad kiruv workers only, there are plenty chasideshe, litvishe and other great people working in former USSR. "Anyhow, Goy She-shavas is chayav misah! Better he should attend the games on Shabbos Kodesh." One can certainly understand your objection of Rabbi Lazar's prior actions, but to say of him נכרי ששבת חייב מיתה is a bit too much! The man is a Jew, regardless of whatever past bad choices he may have made. “ Once you become somebody's poppet - you have to do what your master tells you to do. chabad was the first in Russia. when the rebbe came out with the concept of shluchim the world laughed; now they're all doing the same with a different name-kiruv. not true, u r obviously biased against chabad. People should dan lekaf zchus a person (as they should before criticizing yid and especially rabbi); but people have a right to criticize the practice, especially when it's public and in the name of rabbinate (as he is accepted Chief Rabbi) and such a practice has reverberations in other areas, so people have a right and obligation to voice their opinion that it is wrong. With that in mind the Rabbi should commended for his actions in revival of yiddishkeyt in Russia. This obviously is a highly enlightening and informative and respectful reply! I am sure this Rabbi spoke to his Rabbi before taking on such an act. Who are you to judge a fellow Jew? One who has given up the comforts of living in America or Israel with his family just for the sake of bringing yiddishkeit to Jews in Sochi is a much higher level than any of his critics. Let's see any one of you give up the comforts of living where there are supermarkets and restaurants with Kosher food, Jewish schools and camps for your children to attend and do that just to help your fellow Jews. AND!!! He lives in Russia! Please. Putin, a quasi dictator and strongman, has been good to the Jews. He asked his Jewish representative to make an appearance at a PR situation that is important to him. On Shabbos. The Jewish person, decided it is important to be there. the SA says a yid who has to be mishtadel by Goyim is allowed to shave and wear shoes on days It isn't permitted. I read once that the reason Rabbi Moshe sherer didn't have a beard is because he was involved in govt. Etc.